Since competition in the photography industry is gathering pace, it becomes essential to find the right tactics to attract and keep your customers. Whether you do wedding, portrait, fine art or stock photography, you need to be armed with three main marketing tools: a good-looking website with your portfolio, a Facebook or Instagram page showing your current projects, and a stylish business card with all contact information. Though sharing a business card may seem a bit old-fashioned, it is a great way to gain audience in offline communication. Be it a bridal fair, a press conference or a fashion show, you can always meet a number of people who may become interested in your services. 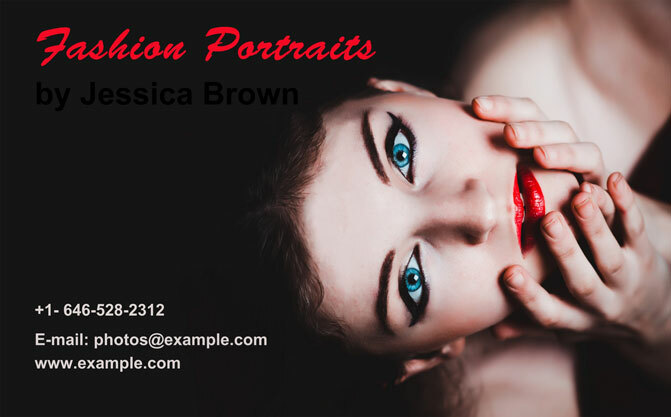 What should your business card be like to convince the recipient of choosing you as the photographer? It must look fabulous. Fonts, colours, textures – everything should be harmonious and perfect. As the life motto of any photographer is “a picture is worth a thousand words”, your card should present some of your best shots on its sides. A business card is a means of staying in touch. So all the necessary information should be right there – your phone number, studio address, website, etc. All the best photography business card ideas are united by one major design principle: your card should mirror your personal shooting style. And of course, the ideas differ by the field of photography you are working in. Since all photographers are editorholics, there can be no doubt that you will want to design your card yourself. Besides, with the best business card design software like Business Card Maker you can not only create cards for yourself, but also enrich your studio services with designing personalized cards. 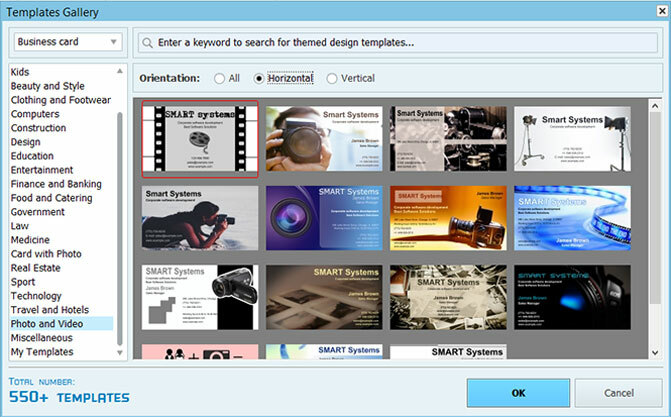 This Windows-based tool offers a large gallery with 550+ design templates, and each of them can be fully personalized. Check out the ideas below to find the card type that is right for you. Wedding boutiques, flower shops, romantic restaurants and car rent offices are the best places for a wedding photographer to have friends. Leaving a pile of business cards there will surely be a wise marketing step. 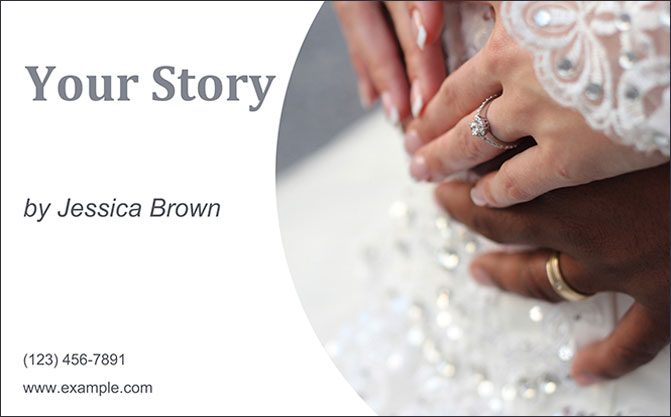 One of the most popular wedding photography business card ideas is to set a part of the wedding photo showing the dress, the hands with the rings or the bouquet as the background of the card. Italic font styles are the most suitable here, as they highlight the concept of tenderness and love. 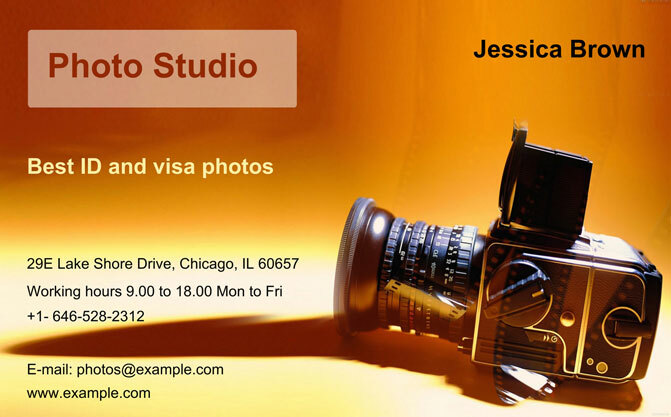 If you own a photo studio, one of the winning photography business card ideas is to use your gear as the symbol of your serious approach to the matter. Cameras, lighting equipment, everything that suggests that you are the reliable one who plays by the rules and knows all the requirements that have to be known about passport or visa photos. Business Card Maker can create double-sided cards, so you can even list out the ID types you are dealing with on the rear side. Whether you deal with solo or group photos, beside the artistic and editing skills you should possess great communication experience. With Business Card Maker, you can create a photo grid displaying your best shots and the variety of portraits you can do. If you deal with only one type, you should place the focus on it. For instance, if you do creative kids portraiture, embellish your design with funny clipart or bright colored textures. If your specialty is fashion portraits, adding a picture of a pretty girl is usually the best trick. 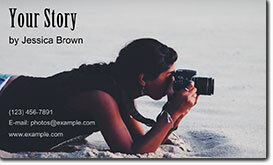 Photography business card ideas for journalists and travel photographers are very different from the previously described sets. 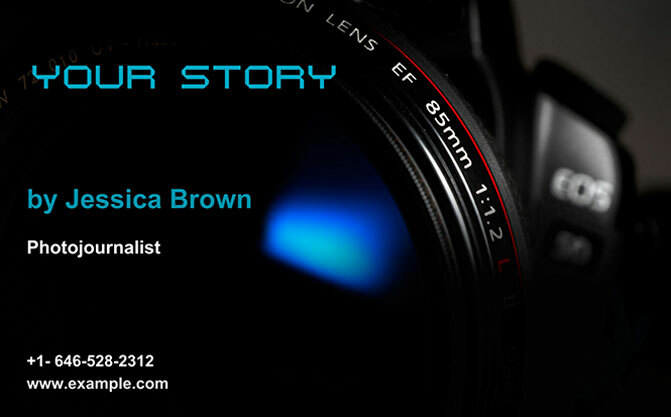 If you shoot unlimited range of events, your business card should be minimalistic in design. That is, it may include images and clipart, but the card needs to look classic in general. If you specialize in some certain field, like sports events or city life news, you can create a design based on the printed photographs or filmstrip idea. You can take a photo of your old filmstrips, or make use of some images that Business Card Maker offers in its gallery of backgrounds. Another great plus of creating your business card yourself is to manage the printing process directly. Being a photographer, you know for sure what kind of paper and what size you want. Using Business Card Maker, the task becomes quick and easy as the software has an intuitive interface and the printing module has all the features necessary for customization like spacing, crop marks and print resolution options. Pick up one of the photography business card ideas and get your personalized identity & marketing tool today!